We learned a lot about friction doing what we dubbed our Sword in the Stone science activity. We experimented with taking a cooking skewer (or pencil) out of a bottle filled with rice. We began by just putting a bit of rice in the bottle and then pushed the wooden skewer all the way down into the bottom of the bottle. We easily pulled the skewer out since there was not enough friction to keep the skewer down. We then added even more rice and tried again. Once our bottle was filled to the top we tried one more time with the skewer but our wooden skewer was so thin that it easily came out yet again. I decided to take a pencil and try the experiment over again... the pencil worked like a charm and the force of all the rice pushing in on the pencil allowed us to pick the bottle right up off the table without the pencil slipping or moving at all! No matter how high we lifted it! Everyone tried and no one could get the" sword" of out of our "stone"
As we kept filling our bottle we did tap it on the table to make sure the rice settled in and we fit as much rice as we could in it. As we had the rice settle in we increased the friction the rice would have on the pencil. I have GOT to do more science with my guys! It is so fun! 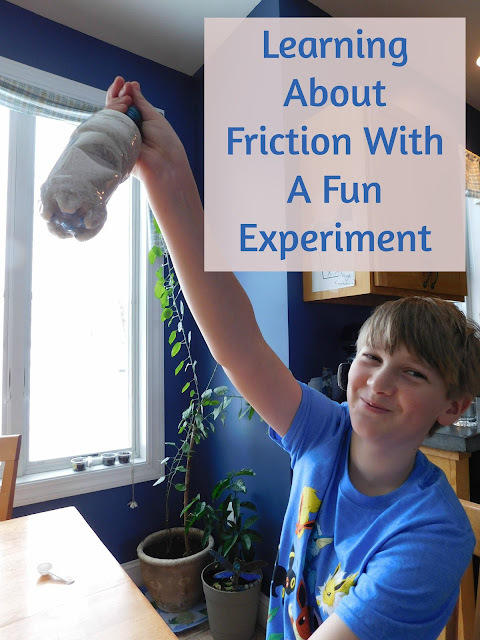 Even simple experiments seem to elicit exclamations and squeals.